UPDATE: Orange confirms iPhone November 10th release and pricing | What Hi-Fi? The iPhone will be available in all 402 UK Orange stores, its online shop, telesales channels, and its Orange HMV concessions, as well as through Apple Retail Stores, Carphone Warehouse, Phones4U and other selected high street partners. Tom Alexander, CEO of Orange UK, said, “Since we announced the iPhone on Orange we have already seen more than a quarter of a million customers register their interest on our website. We will be matching their enthusiasm with a 3G mobile broadband network that covers more people in the UK than any other operator, a commitment to deliver the best 3G experience on the iPhone and best-in-class applications and plans. • Pay Monthly - iPhone 8GB, 16GB and 32GB models will be available on multiple monthly plans, with the 3GS free on all £45 plans and the 3G model free from £30 plans (both with a 24-month contract). For those looking for full all-inclusive packages, a new high end “traveller” offer with inclusive roaming call and data allowance is available at £125 month. All plans include unlimited** anytime, anywhere UK mobile data usage on Orange's data network, which has the largest 3G population coverage in the UK. In addition customers will also get free unlimited use of the UK's largest single public Wi-Fi network, BT Openzone. 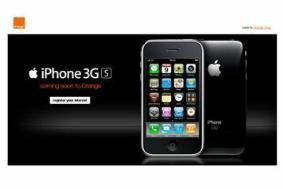 • Pay as You Go (PAYG) – Customers topping-up by £50 at purchase will be able to buy an iPhone 3G on Orange PAYG for £333. Any customer buying an iPhone on Orange PAYG will automatically get 250MB of data each month, plus unlimited use of the UK's largest single public Wi-Fi network, BT Openzone, for 12 months. • SME Plans - Similar to PAYM Consumer pricing, with an additional £50 monthly tariff. • iPhone tethering bundles - Customers wanting to use their iPhone to get mobile broadband on their laptop can take out additional bundles starting at £5 per month. Full details on pricing and plans available at www.orange.co.uk/iphone. Mobile provider Orange has announced an agreement with Apple to bring the iPhone to its customers later this year. The deal ends 02's UK exclusivity on the iPhone, and means Orange now offers the Apple Phone in 28 countries and territories worldwide. The company says it has "the largest 3G network covering more people in the UK than any other operator." It "will sell iPhone in all Orange direct channels including Orange shops, the Orange webshop and Orange telesales channels, as well as selected high street partners." A pre-registration site for customers to log their interest has been launched. Orange says it will release more information on pricing, tarriffs and availability "in due course".